Have your students ever heard of an interlock puzzle? An interlock puzzle is a seemingly whole object that actually consists of several different pieces that are assembled together in such a way that it won’t fall apart when released. The difficulty with these types of puzzles is on how they can be disassembled and re-assembled back together. 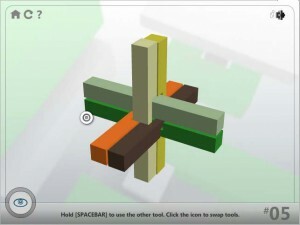 This smartboard game provides players with several different interlock puzzles, and challenges them to dismantling the figures (the use of the keyboard is required, and a Smartboard Wand is highly recommended). The puzzles become increasingly difficult as the students progress, which in turn exercises both their patience and their logical thinking. Group play can be conducted by giving each team a time limit to complete the most number of puzzles that they can. The group who finishes the most (or who solves the last puzzle the game can provide) wins. Help a child named Max cross the river by choosing the correct stepping stone/log/water lily (depending on the game’s difficulty level). 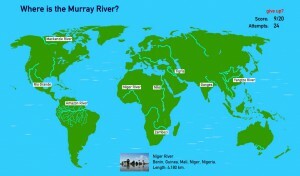 Each of the river object is associated with a word. The object that can hold Max’s weight – and can thus send him across – contains the word that rhymes with another given word. Choose the wrong word, however, and Max falls into the river! 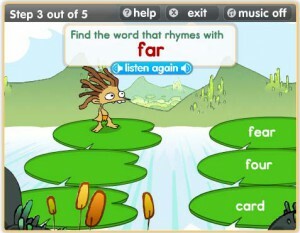 Two groups of players can compete to see who can get the correct rhyming word first. There are only five steps, so this ensures that the game cannot end with a tie. Alternatively, it can also be a race to the finish – which team can get across with the least amount of tries? GeoWorld is an excellent geography smart board resource, where a knowledgeable bear provides students information about the countries of the world, including country-related facts, pictures, music, videos, and even climate info! Once the students have had their fill of the continent they’ve chosen to learn, everyone can now proceed to the GeoGames, where players are asked to point the given state or country on a given map of the area of the world they were covering. A correct answer gives the player 10 points, but an incorrect one gives a penalty of -5. 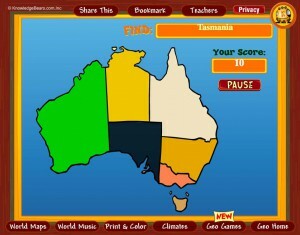 The game will continue until all the states/countries have been answered correctly. With everyone working together, how high can they score? Or if they wish to be competitive, if the students separate into groups – with one group trying to answer while the others have their backs against the smart board (no peeking!) – who will gain the highest points? Play and find out! It can’t be difficult to move stones so that they’re all sitting beside one another, right? But what if, instead of lifting them, you can only move them in a straight line, in a limited space? How many moves will you have to make before all the stones are together? 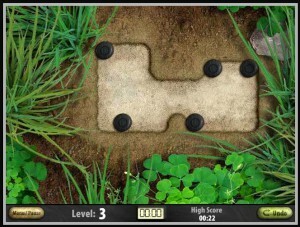 This puzzle challenges your students’ logical thinking (along with yours) by asking them to slide a given set of rounded stones into one of four directions until all five of the same color are touching. Not only will they have to use each stage’s terrain to meet their objective; sometimes the stones’ positions themselves will help them. There are many ways to turn this game into a challenge for group play. The students can play a certain number of levels, the winning group of which would be the ones where the least number of moves were made. 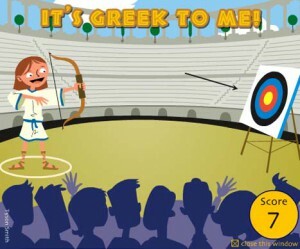 Alternatively, the groups would play until the stars awarded by the game are less than a certain number the teacher had set – whomever reaches the farthest level wins. 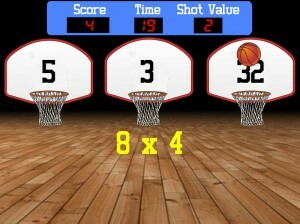 Or this could, once again, be a game where the students can pit themselves against their teacher to see who is better. Whichever mode is chosen, this game is sure to be fun and challenging for everybody! Enhance your student’s shape recognition skills with this Valentine Day-themed puzzle game! 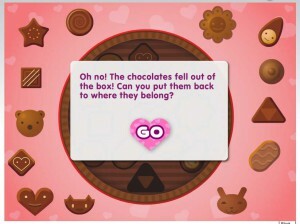 A box full of chocolates in various shapes have fallen, and it’s up to the player to put them back in their proper place. Once they’ve succeeded, they can continue clicking on the chocolate pieces to “eat” the candies. The teacher can add a real-life element by rewarding kids with real chocolates for every correct shape that they can solve. 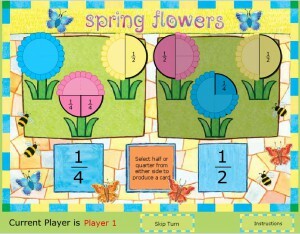 Alternatively, the kids can also play as groups, where each group takes turns in inserting a shape (there are 13 shapes in total – the teacher can use one shape as an example on how to play the game to make the total even). The group that manages to get the most shapes correct wins their own personal box of chocolate to eat (and share)! 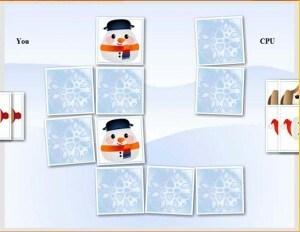 Exercise your students’ memory this winter with this Snowman Memory game. It plays like most pairing memory games: players take turns in revealing two randomly sorted upturned cards on screen. If the revealed cards do not match, the cards will be turned over again to hide the images. If they match, the player keeps the paired cards which count as a point. The player with the most points wins. Players can fight against the computer (that has a modifiable AI setting the teacher can set), or against each other. The big challenge with this version is that most of the images look nearly the same, if not for the snowmen’s different colored scarves and hats. As such, even adults may find it a little difficult… so perhaps a teacher can take this as an opportunity to play the game against her students and see how well his memory is compares to theirs!